Hello, Friends Aaj Ke Is Article Ke Jariye Ham Facebook For Creator App Ke Jariye Aasani Se Paise Kaise Kamaye Jaate Hai Uske Baare Me Baat Karege. Jo Facebook Ne Haal Hi Me Launch Ki Hai, Ye Ak Facebook Ki New Opportunity Hai. Vaise To Facebook Par Bahut Sare Log Hai Jo Best Earning Kar Rahe Hai. Aapne Facebook For Creator Ka Naam To Suna Hi Hoga, Lekin Kya Aap Ye Jaante Hai Is Se Paise Kaise Kamaye Jaa Sakte Hai. Is Se Youtubers Bhi Paise Kama Sakte Hai, Agar Aapko Nahi Pata Ki Youtubers Kaise Paise Kama Sakte Hai To Ye Article Padhe...➥YouTube पर Earning कैसे बढ़ाएं Famebit से Sponsorship Kaise Le. 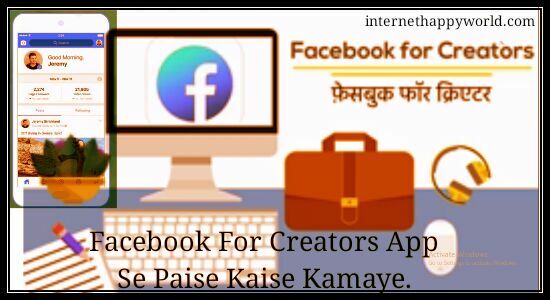 Facebook For Creator App Se Paise Kamane Ka Sabse Aasan Tarika. Facebook For Creator App Kya Hai? Ab Facebook Ka Ak Naya App Aaya Hai, Jaha Par Ab Aap Apne Talent Ko Dikha-Kar Good Earning Kar Sakte Ho. Facebook Ab Facebook Creator App Launch Kar Raha Hai. Jiske Baare Me FB Ne Apne Users Ko Unki Website Par Bataya Hai, Is App Me Aise Kai Features Hai Jo Aapki Kamai Badhane Me Help Karenge, Yaha Par Aapko Step By Step Puri Process Bata Ne Jaa Raha Hu. Is App Ko Use Karne Ke Liye Aap Apne Computer Se Bhi Login Kar Sakte Hai. Agar Aapne Abhi Tak Facebook Par Paise Kamana Sharu Nahi Kiya Hai To Ye Application Aapke Bahut Kaam Ki Hai. Facebook Creator Par Naya Account Kholkar Aap Ye Kaam Kar Sakte Ho. Yaha Par Ham Aapko Bataa Rahe Hai Account Open Karne Se Lekar Best Earning Kaise Ki Jaati Hai, Tak Ki Sari Process Bataa Rahe Hai. Aage Read Kare Kaise Kama Sakte Hai Facebook For Creator App Ke Jariye Paisa. Aur Full Process..
➣ Facebook For Creators App Par New Account Kaise Banaye. 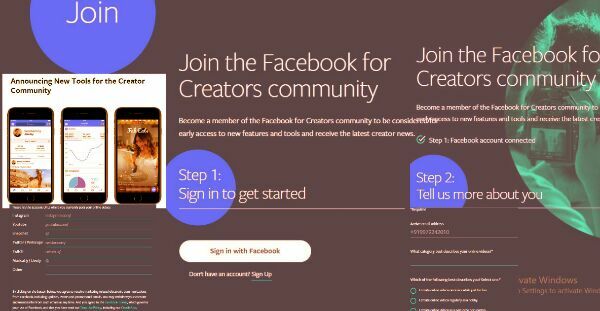 Facebook for Creators पर न्यू अकाउंट ओपन करने के लिए आप अपने Browser में टाइप करे https://www.facebook.com/creators/join उसके बाद एक न्यू पेज ओपन होगा। जहां पर लिखा होगा Join the Facebook for Creators Community इसके नीचे लिखा होगा..
चौथा ऑप्शन है (I create online videos as my full-time occupation.) यानि की आप अपनी वीडियोस फुल-टाइम अपलोड करते है. और लास्ट ऑप्शन है None of the above. bahut he badiya article likha hai apne. bahut hi shandaar or knowledgeable article shrare kiya hai aapne sir. This is really nice post. So thanks for sharing such a awesome post.